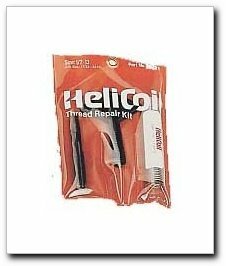 Heli-Coil has the most effective and universally accepted method of thread repair. Heli-Coil inserts quickly and permanently restores stripped, worn or damaged threads to their original size and condition. Inserts work in any part of material; aluminum, magnesium, cast iron, bronze, etc. The use of light weight materials in fuel efficient cars means more thread damage..there is a Heli-Coil insert to repair virtually every application. Restore parts that otherwise would have to be scrapped. If you have any questions about this product by Helicoil, contact us by completing and submitting the form below. If you are looking for a specif part number, please include it with your message.